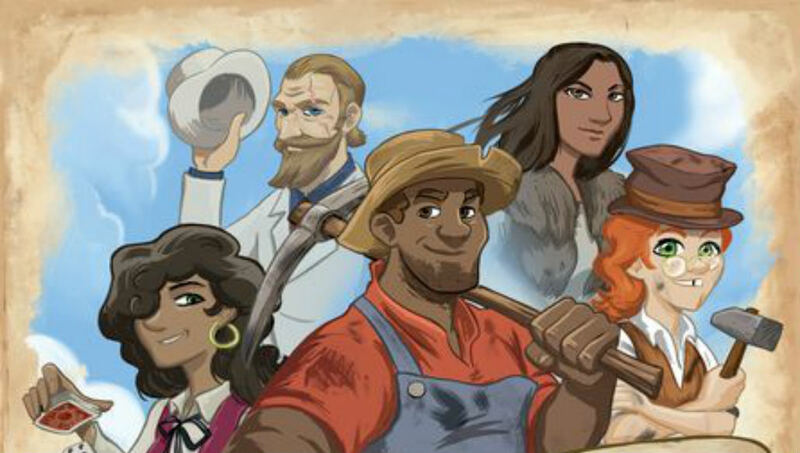 The cover of Pioneer Days depicts a colorful cast of characters smiling and looking like they’re having a splendid time in the great outdoors. I had the pleasure of learning about the migration west on the Oregon Trail in my 8th grade California history class, and I can tell you that it was definitely not all sunshine and roses. The journey was rife with starvation, disease, and death. It was certainly profitable for some people who traveled West in search of gold or a better life, but most failed to find riches. It’s a cliche now, but there’s certainly some truth to the idea that the people who “made it” during the Gold Rush were those selling shovels. Still, there’s a certain amount of romanticism people give it, and Pioneer Days latches onto that with enthusiasm. That’s not to say that there isn’t any danger in Matthew Dunstan and Chris Marling’s take on Oregon Trail migration. As you go along meeting townsfolk, acquiring supplies, and raising cattle, four progression bars will slowly advance. When they trigger they will cause a negative effect to everyone—maybe disease will plague the travelers and everyone will need to spend medicine to try to keep the townsfolk accompanying them alive. Or maybe you’ll be raided and lose half of your money. These disasters are less catastrophic portents of doom and more bumps in the road to keep an eye on. The kind of existential dread you’d find in a game like Agricola is completely absent. I suspect that will be a positive attribute for many people, but I’m a bit disappointed. The best part of the disaster system is that its progression is determined pseudo-collectively. 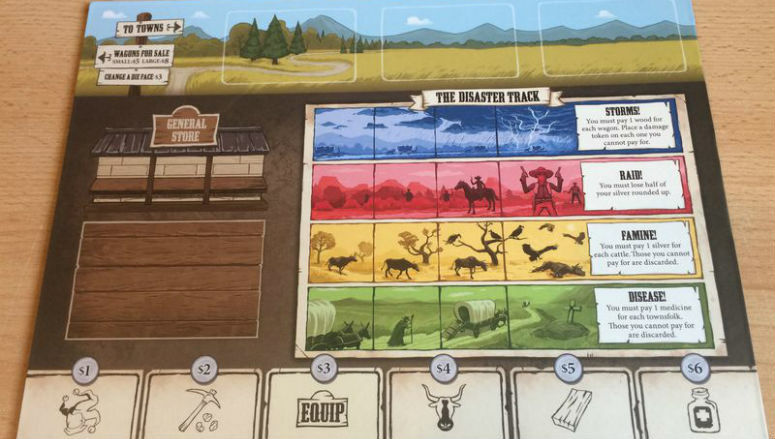 Pioneer Days is a dice-drafting game where the number of dice available at the beginning of any given round is equal to the number of players plus one. The color of the one die left at the end determines which disaster track progresses. If a dreaded black die remains, all four of the disaster tracks advance. Avoiding that fate would be simple, except that what the dice actually give you on your turn depends on the symbol displayed, not the color. 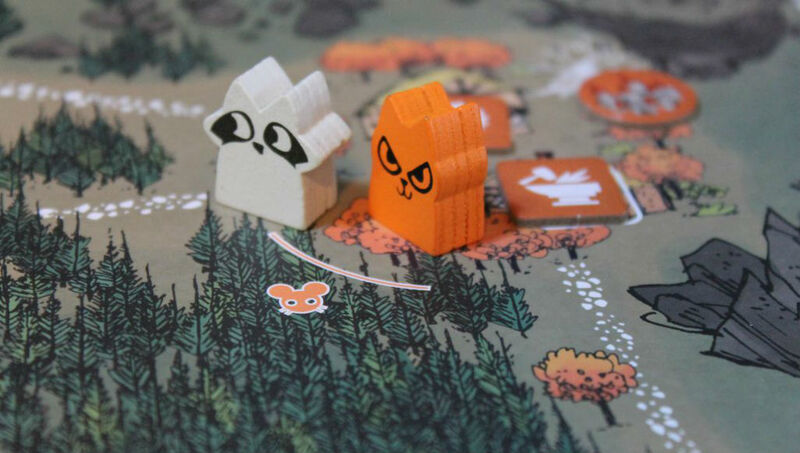 Each time you draft a die you get a choice: use it to acquire the good indicated on the die, get some money (again dependent on which symbol you take), or take one of the townspeople. The decision space is cleanly presented and frequently all three choices will be compelling in different ways. 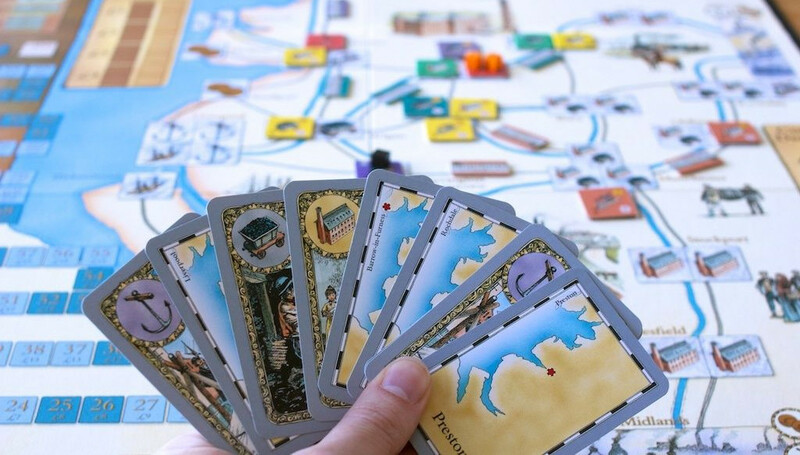 In general, game play involves going round and round, drafting dice, protecting against looming disasters, and trying to efficiently acquire victory points. There are a few VP-acquisition routes, and while all of them have different subtleties, they seem more or less equally viable. Each week your party encounters some towns and can spend various resources to get more points. It’s all a bit point salad-y*, rewarding both long term planning and opportunistic tactical plays at different times. As you play you’ll be muttering to yourself, “yes, yes, I see what they did there. That’s nice.” And it is nice. This is the part of the review I always get to with games like this where I realize that I’ve been droning on about this and that mechanism and making the game sound very dull. The reality is that Pioneer Days isn’t dull, just safe. It’s a fine design with pleasant (though occasionally weirdly inconsistent) artwork. As you play you’ll be muttering to yourself, “yes, yes, I see what they did there. That’s nice.” And it is nice. The problem is, while that’s its greatest strength, it’s also its biggest weakness. Sure, in a two-player game there might be more opportunities to set up the disaster track to severely cripple your opponent. But resources are plentiful enough that it won’t be too punishing most of the time. Maybe you’ll stumble upon a really slick combo that surges you ahead of the pack, but a lot of that is luck of the townsfolk draw. Pioneer Days gives you exactly what’s displayed on the cover—a pleasant stroll through the 19th century countryside. The cast of characters provide some fun, varied play. The TMG logo promises player-specific powers, because that seems to be baked into every publishing agreement they touch. The clouds on the horizon signal some push your luck disaster-swerving. The game feels like sitting down to watch a familiar sitcom. You’ve seen all of the broad strokes before, but they’re comfortable, and the details will frequently bring a smile to your face. * ”Point Salad” is a sometimes-pejorative term for games that distribute victory points for nearly every action available to the players. Pioneer Days is a dice-drafting euro with a light touch. It’s not the most innovative or exciting game, but you’ll have fun strolling down the Oregon Trail.